Sherbrooke Family Dental Clinic provides dental implants in the West end of Edmonton. We understand that a patient’s smile impacts their confidence and overall happiness. Because of this, we take great pride in helping patients who are missing teeth restore the functionality and confidence they’ve lost. Dental implants are a reliable and durable. Comprised of a titanium support post that upholds a restoration, these devices live in the jaw bone and mimic a natural tooth from the root structure to the visible crown. Numerous restorations can affix to a dental implant to restore the loss of one, multiple, or all teeth, including a single crown, a bridge, dentures, and even removable dentures. 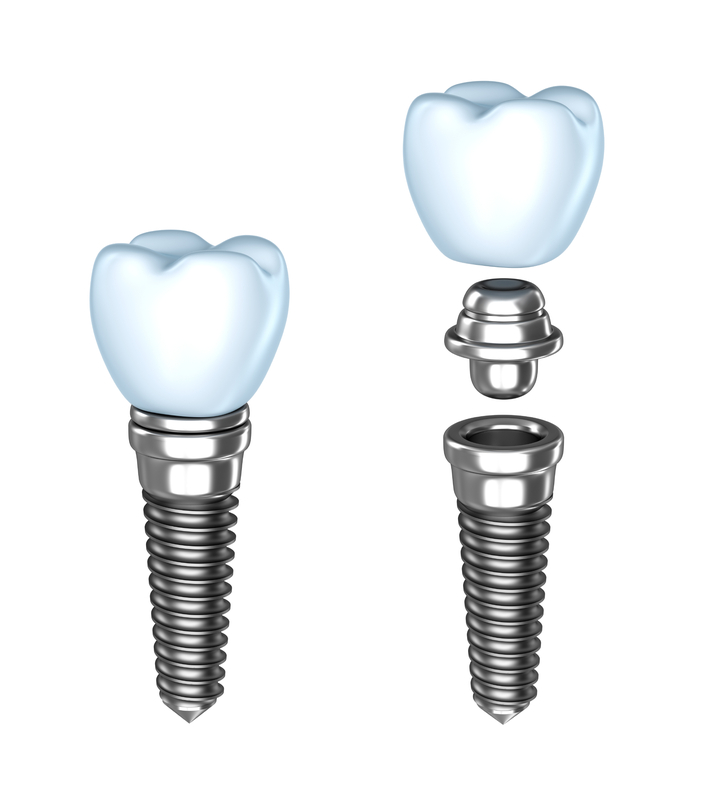 With dental implants, the implant itself upholds the integrity of the jawbone, similar to the roots of a natural tooth. This is important because without those roots, the jaw bone recedes, eventually causing the facial tissues to have a sunken appearance. In losing a tooth or multiple teeth, patients also lose the functionality, negatively impacting digestion, speech, and the types of foods they can eat. When a tooth is lost, neighboring teeth begin to shift. Over time, this shifting results in gaps between teeth and the misalignment of a patient’s bite pattern. In placing an implant, neighboring teeth are held in place, preventing long term discomfort and aesthetic change. To learn more about the entire dental implant procedures, watch our dental implant video presentation. Our Northwest Edmonton dentist will perform all aspects of the dental implant procedure in house. From placing the implant to crafting the restoration, you can conveniently visit our office to obtain the restoration you desire. Tooth extraction – If the health of neighboring teeth has been compromised, we may suggest extracting potential problem teeth. Tooth extractions are performed in our office, under gentle sedation. Bone grafting – In some instances, a patient does not have enough bone to secure a dental implant. For these patients, we place bone grafts to rebuild the jaw bone or restore facial tissues to prepare for a dental implant. Sinus lift – Similar to a bone graft, a sinus lift adds bone tissue to your upper molars and premolars. This tissue helps prepare for a dental implant. Contact our office if you have any questions or would like to schedule a consultation for dental implants.